How to React when your Boss Reprimands you? Being reprimanded by your boss is one of the worst things you could ever go through. If you have been disrespected or put down by your boss before, let us first tell you that we completely understand how hard it is for you. If you feel bad about it, it is completely normal. But there is also a way to go about it. 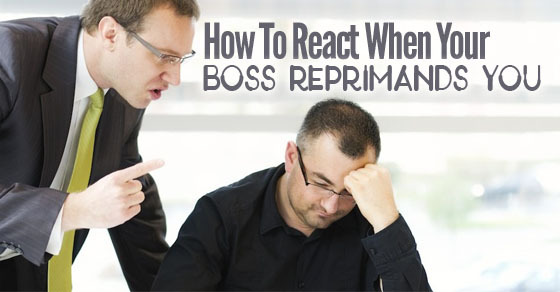 In this post, you will learn how you must react when your boss reprimand at work. Whether it is verbal or in front of your group of friends, you will be able to handle this in a much better way after reading this post. The term ‘reprimand‘ means to criticize or express anger in such a way that is insulting to the other person. Reprimanding someone can often be embarrassing especially if it is done or said in front of others. It has often been described as a lengthy rebuke or an act of reproach. Those who have been disapproved by their boss before or have experienced serious/rude criticism have been reprimanded. How to Deal with Verbal Reprimand at Work? Getting a verbal warning at work from the boss is nothing unusual nowadays. It is quite common these days to get a verbal reprimand from your boss. You should always ask for a certain time to speak to your boss so that there is no interruption. You must also discuss any serious issue which is related to your recent work performance, Grab a cup of hot coffee for your boss, go to their room when they are free and speak to them about it. Being reprimanded is quite normal but how you handle the situation is far more important. For that, you must take a step that is professional. When you are with them, talk about having a meeting so that you can discuss the whole matter. The second thing you must do is have some specifics in mind. When your boss says you are not a team player, it will obviously sound very sad and heartbreaking. So what you should do in cases like this is, ask them what has gone wrong and if there are some instances he or she can give you about the behaviour. You don’t have to be confrontational or even defensive. You can listen and take a few notes down so that there is no more reprimanding in the future. Several people have done this and it has worked wonderfully for them. We bet it will do the same to you. The third thing you must remember to do is have a clear road map so that you know where exactly you need to go. You must have goals set in mind from beforehand so that you meet the expectations of your boss. Don’t have short term goals at all. Have long term goals in mind instead. When you set goals in mind, you will obviously be able to reap its benefits. So do that if you really want to survive a reprimand from your boss. After you have completed your meeting, you can use the notes that you have written before to write up at work a few emails to your boss. You can also outline some of your new goals and expectations. Speak to your boss and tell them how much you like and appreciate some of their feedback. You can make sure to send your boss a few emails when you have already met all those expectations. But always remember that bosses are not the only people who can paper-trail. You must remember to keep a good track of your accomplishments and achievements that you have made in the past. This will help you have a good proof of what you have done for them. Now, this sounds a bit strange but here’s how you should go about it. Once you already have the idea of what your boss is expecting from you, it is now time to take a quick look at your previous performance. Do you think the verbal reprimand is an indication of another problem that could be more serious? Or do you actually need some anger management classes or maybe a bit more training in those areas where you get defensive because you don’t even have certain skills. This could actually be a good chance to look for a good mentor and see who can give you better feedback. How to Respond to a Written Reprimand? Ever received a written reprimand from your boss? This is how you should answer them! Most of you probably do not know what a written reprimand actually means. A written reprimand is basically a written document of your performance that is probably negative or unacceptable. It could also be a written account of the whole incident or even an action of what you have done recently that has put them off about you. By giving you a written reprimand, you will actually come a little close to the accusations that have been made and what you can do to correct them. A reprimand in the document can be delivered directly towards the employee by using a supervisor or even the manager who is documenting such an incident. Employees usually have summoned to a private meeting where the reprimand has been given and the employee is expected to read the whole nature of the infraction. You can use this time to clarify anything which is written in reprimand. If you have seen any deviations, discuss them openly with the supervisor. There are several employers to operate under the procedures and the guidelines which are specified by the HR department of the company. The procedure of any discipline at work includes reprimands in written documents and it is commonly governed by several guidelines and some policies. You must ask for a copy of the employee discipline form and make sure that you understand all of your rights. You should also be very aware of any of the rules which are pertaining to the deadlines for replying to any insult or any procedure that needs to be followed in the whole process. You must also remember to lay emphasis on the facts. Though you could feel a little low when you receive a written document, always remember that there is no need to handle the matter in a very emotional manner. You should remember to be professional and look if there are any factual errors or even information that is not correct in the document. You have to address the matter in a positive manner. In case you don’t agree with something, you can support it using evidence. If the reprimand is right, then immediately apologize and try to solve the matter. How to deal if Boss Reprimands you in front of Co-workers? If your boss ever disrespects you in front of the other staff or the co workers, this is what you should do about it! You can always ask your boss on what is really needed at this point in order to move forward. After that, you can start making those changes which are needed in the behaviour or the effort which has been indicated in the job. You can also request for a written memorandum by simply outlining what is needed and what are the steps included for improving the performance. Dates should also be identified for more periodic reviews. You also have to keep a copy of the records just in case. When your boss is insulting you in front of others, you can keep quiet first so that they can speak their mind and let you know what is putting them off about you. Once that is done, you can go back to your office and think what exactly has gone wrong and what you need to do about it. Thinking about reprimands can improve your life at work in several ways. You will finally begin to understand where you have gone wrong and make those necessary changes. How to Handle a Reprimand from your Boss? And finally, this is how you should handle a mean comment/reprimand/insult from your boss at work! A good boss is someone who will speak to you in private when concerned about your performance or your current status at work. He is also someone who will speak about the problem that he has at this point and how he feels you can improve yourself. But if your boss is doing the exact opposite, then you have to, first of all, understand that he is not a good boss and in order to deal with him in the correct way, you have to first understand that you can’t get angry or mad at him. A way in which you can solve this situation is by simply listening silently to him. If you have missed any deadline, you have to first own up to it. If you have created a problem at your work place, you have to promise your boss that you realize it was an honest mistake and that you are willing to make changes. Once you have made a huge mistake and you realize that it was your fault, you have to show some kind of responsibility. You have to apologize to your boss and say that you will cover the future projects within the deadline. There are times when the comments you hear from your boss will be rather an inappropriate one. Sometimes your boss will blame you for things you haven’t done. And if you ever fall in that situation, simply ask your boss in a good and respectful manner to bring such concerns to you in a private manner. If it goes out of control, then that too needs to be bought with attention. If you have bought such a problem in the conversations before, then you have to remind your boss of this situation and that you can provide proof that it wasn’t your fault. Once you and your boss have discussed the particulars and the issues at hand, you can work with them and reach a proper consensus. An example can be used to explain this. If you have been blamed for something, there are chances that your boss will issue a warning about your current level of performance and will pull future actions on the table if any problem like this happens again. If such a reprimand is uncalled, you have to request the matter to be examined. The boss should be encouraged to speak to the person who is delaying the production. When you are working in an organization, there are times when you accidentally do some mistakes or not able to work as expected. This is nothing unusual and sometimes due to this, you may have to hear hard from your boss. It again totally depends upon the employers and the complexity of the mistake done. But there are instances when your bosses push the line which he shouldn’t. And this can make the situation even worse for the employees. Here are a few unacceptable scenarios or limits which the employers must not cross at any point of time. With this, we would like to bring the post to a close. If you have read this post and found some genuine help from it, do let us know about it in the comment box below. We would be more than happy to hear from you. Also if you have any questions in mind, kindly inquire to us about it. It would be a privilege to keep in touch and answer all your queries. On that note, good luck and here’s hoping that you will be able to handle and deal with your boss in a better way.